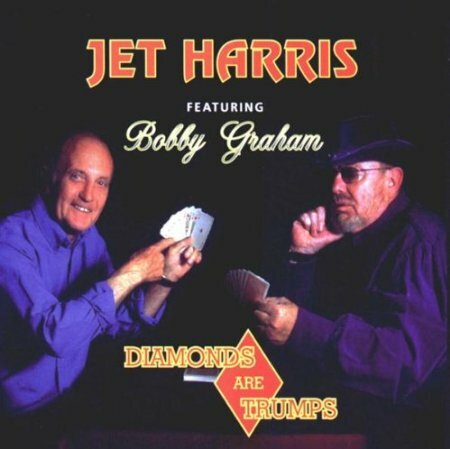 “Diamonds Are Trumps” was Jet’s 2002 album only a few years before he died. As one of the original London rock-n-rollers Jet lived life to the full both during his days with The Shadows and later as a solo Artiste. Terence Harris MBE (6 July 1939 – 18 March 2011), known as Jet Harris, was an English musician. He was the bass guitarist of the Shadows until April 1962, and had subsequent success as a soloist and as a duo with the drummer Tony Meehan. Harris, the only child of Bill and Winifred Harris, was born Terence Harris at Honeypot Lane, Kingsbury, North West London, England. His prowess as a sprinter at Dudden Hill secondary modern school earned him the nickname Jet. Although he learned to play clarinet as a teenager, he made his own four-string double bass to play in a jazz group and later graduated to a professionally made double bass. In 1958, while playing jazz with drummer Tony Crombie and his group the Rockets, Crombie got a Framus bass guitar for Harris, making him one of the first British exponents of the instrument. He subsequently was given by Cliff Richard the first Fender Bass (sunburst) guitar in the UK in 1960 about a year after band-mate Hank Marvin had received his first red Fender Stratocaster guitar. Both instruments were eventually replaced with matching versions, used in the film The Young Ones in which The Shadows played “The Savage” (showing the famous Shadows’ walk) to an invited audience of teenagers. He played in several groups including the Vipers Skiffle Group and the Most Brothers before, in 1959, joining Cliff Richard’s backing group, the Drifters, who later changed their name to the Shadows at Harris’s suggestion. In 1959, after the neck of his Framus was terminally damaged in a dressing room accident, he was presented by the importers with a Fender Precision Bass, one of the first to come to Britain from the United States. In Mike Read’s book, The Story of the Shadows, Harris lays the blame for the start of his depression and related alcohol addiction with Carol Costa, whom he married in 1959. In 1962, he left the Shadows following disagreements (documented in The Story of the Shadows, written by the group with Mike Read). He signed with Decca and released solo instrumental and vocal work with some success. Then, as part of a duo with former Shadows drummer Tony Meehan, he topped the UK Singles Chart for three weeks in early 1963 with “Diamonds”. Harris and Meehan followed this with two further hit singles, “Scarlett O’Hara” (also written by Jerry Lordan) a UK No. 2, and “Applejack” (composed by Les Vandyke) reaching UK No. 4 also in 1963. Harris’s solo singles made prominent use of the Fender Bass VI in lead. “Diamonds” and “Scarlett O’Hara” were recorded using that instrument. Harris was partly responsible for helping Jimmy Page and John Paul Jones break into the music business. Page’s first major session was as a rhythm guitarist on “Diamonds” in late 1962. After “Diamonds” became a hit, Harris and Meehan hired Jones to play bass in their touring band. There were several court appearances involving drunkenness and violent behaviour before the partnership with Meehan came to an abrupt end in September 1963 when a car crash on the A44 near Evesham, Worcestershire, (in which his girlfriend, singer Billie Davis, was also injured), meant that this success did not last long. Harris attempted a comeback as the Jet Harris Band, in 1966 and was briefly in the line-up of the Jeff Beck Group in 1967, but somewhat fell out of the music industry. He then worked variously as a labourer, bricklayer, porter in a hospital, bus conductor, and as a seller of cockles on the beach in Jersey. Harris and Meehan also made two short cameo appearances in the black and white movie Live It Up, released in 1963. In the film, Jet and the Jetblacks played “Man From Nowhere”, whilst the duo performed “(Doin’ The) Hully Gully”, a vocal track released as the flipside of their hit “Scarlett O’Hara”. Harris was declared bankrupt in 1988. The BBC reported that it took Harris 30 years of heavy drinking before he finally admitted to being an alcoholic and sought help. For many years Harris made a point in his stage shows of saying how long it had been since he quit drinking, winning applause from audiences who knew how it had wrecked his career in the 60s. Harris still played occasionally, with backing band the Diamonds or as a guest with the Rapiers, and guested with Tony Meehan at Cliff Richard’s 1989 ‘The Event’ concerts. In 1998, he was awarded a Fender Lifetime Achievement Award for his role in popularising the bass guitar in Britain. He appeared annually at Bruce Welch’s ‘Shadowmania’ and toured backed by the Rapiers (a Shadows tribute band). He recorded continuously from the late 1980s with a variety of collaborators including Tangent, Alan Jones (also an ex-Shadows bassist), Bobby Graham and the Local Heroes. His previous problems with stage nerves had seemingly disappeared, and 2006 saw Harris’s first single release in over forty years, “San Antonio”. In 2010, Harris chose to begin appearing with the Shadowers. Regular tour dates and studio recordings with the Shadowers, Brian “Licorice” Locking (Harris’ successor in the Shadows) and Alan Jones, though discussed, never materialised due to Harris’ poor health. In 2007, Harris was invited by UK singer Marty Wilde to be a special guest on his 50th Anniversary tour. This culminated in an evening at the London Palladium with other guests including Wilde’s daughters Kim and Roxanne, Justin Hayward of the Moody Blues, members of the original Wildcats – Big Jim Sullivan, Licorice Locking and Brian Bennett, who also joined Hank Marvin and Bruce Welch of the Shadows on stage with Wilde and his band the Wildcats (Neville Marten and Eddie Allen on guitar, Roger Newell bass, and Bryan Fitzpatrick, drums). The show’s finale featured the closest thing to a Shadows reunion possible with Marvin, Welch, Harris, Locking and Brian Bennett (who in 1962 had replaced the late Tony Meehan) all appearing on stage with the show’s company. The evening was filmed and a DVD released, with Harris playing three tunes – “Diamonds”, “Theme From Something Really Important” and “Scarlett O’Hara” – backed by the Wildcats. So successful was this tour that Wilde repeated the invitation to join him on his 2010 Born To Rock And Roll tour, which finished in Basingstoke on 20 November. Harris has said that this was his most enjoyable working experience in years. In a December 2008 interview for the Daily Mail, Harris spoke about not having been invited to join the Shadows for their 50th anniversary, at the Royal Variety Performance. His fan club arranged a 70th birthday party for him on 5 July 2009, at the Winter Gardens, Weston-Super-Mare. He resided in Bembridge, Isle of Wight. He was appointed Member of the Order of the British Empire (MBE) in the 2010 New Year Honours. In 2010, Harris was presented with a special award from the US Fender guitar company for his services to their company in effectively launching their bass guitar in the UK in 1960. Harris had five sons and a daughter. He was a heavy smoker and died on 18 March 2011, two years after being diagnosed with cancer of unknown primary, at the home of his partner Janet Hemingway, in Winchester. In 2012 the UK Heritage Foundation erected a blue plaque in his memory at the Kingswood Centre, Honeypot Lane, Kingsbury, on the site of the former Willesden Maternity Hospital where he was born. The Shadows by Themselves by Royston Ellis with The Shadows. Consul Books. 1961. No ISBN. That Sound (From “Move It” on, the story of the magic sound of The Shadows), by R.Pistolesi, M. Addey & M.Mazzini. Publ: Vanni Lisanti. June 2000. No ISBN. Jet Harris — Survivor, by Dave Nicolson, ISBN 978-0-9562679-0-0, 31 October 2009.